There are many different ways to trade options. Aggressive traders will trade the weekly options because there is very little time decay(Theta) in the premiums. However, those shorter term options give you very little time to be right. To successfully trade, you must limit the amount of variables going against you. Time til expiration and Theta are two variables that are not on your side if you are buying options. On the other hand, if you are selling those Out-of-the -money(OTM) premiums that expire, you can collect a nice credit. Most traders use outright calls (or puts) to trade short and longer term. 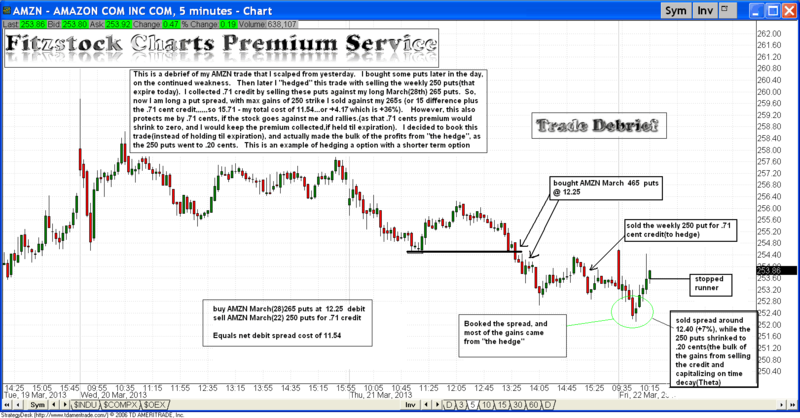 The successful traders are always looking for a HEDGE, or a way to capitalize on selling premiums. When you sell a premium, you create a credit into your account, but are now obligated to delivering the underlying security on maturity(if it settles in the money). In addition, a great way to protect a position is to hedge it with options. If you are long a stock or an option, you can sell an OTM options against it. This reduces your risk, but limits your profit potential. Furthermore, you can buy protection against your existing position and turn your trade into a straddle(own calls and puts). This is done to protect your initial position against short term unpredictability. Options can be very complicated and require in-depth education before trying to trade them. If you are new to options, please consider “paper trading” them before you go live. There is huge risk with options and if you are not educated you could suffer significant losses. You do not need to know how trades debit/credit spreads, vertical spreads, or calendar spreads. Focus on learning the basics of options first, before attempting complex strategies. 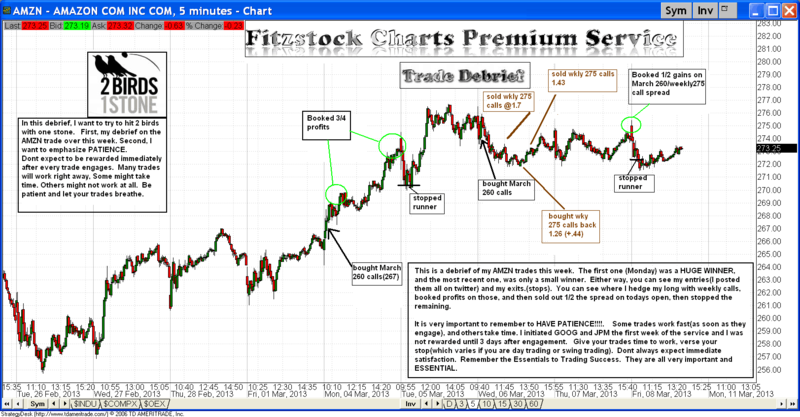 I have illustrated a few trades on AMZN over the last week, where I used options as a hedge. Thanks for that hedging education. What’s the difference between selling otm puts for credit vs buying options the other way? For instance you bought the amzn puts and hedged it with the weekly calls. Wouldn’t it be easier to do this than selling for credit? I’ll will read this hedging piece at least a few more time to understand it. My hedges are placed to reduce risk and Theta. In addition, it also gives me the capability of trading in and out of “the hedge” (scalping). 1. When you hedge against your position, do you have a general rule of thumb on how many contracts you open for the hedge? 2. Do you wait for the original position to go in a certain direction before you open the hedge? 3. I noticed on one of the amazon trades you bought back the hedge after a profit, then sold some more, then booked some gains as a spread. Do you have a general rule of thumb on when to close the options you used as a hedge individually as opposed to booking the profits as a spread? 4. Do you usually use weekly options as a hedge? Thanks for the education. I’ve been very interested in this facet of your system since the twitter days. I respectfully request that you continue to provide illustrations on your hedges as you’ve done for your purchases. I’m sure after several more examples, it will get much easier for us to understand. Keep up the great work and thank you! I hedge my entire initial position. Every trade varies on when I am hedging the trade. There is no general rule of thumb on when I book my profits with my hedge. I hedge with weekly and monthly options. I will continue to provide education on both general trading and hedging with options throughout the year. If day trading and using spreads, do you scale your profits any differently? I understand that with spreads your potential for both gains/losses are a little slower, so I’m wondering if you make any adjustments? Thank you sir!